Detecto's ProDoc® Series Digital Physician Scales with Body Mass Index offer medical-grade accuracy and durability from the brand you trust in clinical weighing at an economical price. The PD300DHR features time-saving digital weight and height measurement, so the patient simply steps on the scale, raises the height rod into position, and presses a key to automatically calculate their BMI. 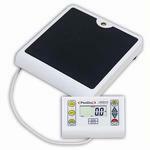 The PD300 series features comfort-height-level display of measurements for convenient viewing.